Sorry for the horrible photo, the light over the stove burnt out so it's dark on that side, and I didn't feel like breaking out the good camera so I took this with my ancient nikon coolpix. Anyway you get the idea! Last night I finally made it over to the Asian market. It turns out, the trip wasn't entirely necessary. I bought spring roll wrappers, sweet rice flour, yellow and white corn meal, plums, basil, and corn starch all for $11. They have a ton of different types of rice noodles, bean noddles, cellophane noodles, etc for really cheap, which is good. But then I went to stop and shop and traveled down the Asian food isle only to find that they actually carry all of the same stuff for roughly the same price. The only thing I think was the best buy was the sweet rice flour. I'm glad I went though, I'd been wondering about that place for awhile. And it's good to know I have a lot of options for noodles if I'm so inclined. I still have yet to find a gluten-free soy sauce, although I've heard that LaChoy is? There's no wheat in it, but it does have hydrolyzed soy protein which I've heard is not so good. I don't use an abundance of soy sauce anyway but I do want to be able to use it. I love chinese food and going to china town for dim sum or other options but now that's all pretty much out of the question. Sad sad sad. Oh well! 1 package of sirloin tips - about 1 lb. I cook by eyeballing everything, so sorry for the not-so-exact recipe! I heated up a non-stick skillet and added a little olive oil to coat the pan. When the pan was good and hot I added the steak and seasoned it with salt, pepper and garlic powder. Halfway through cooking, I seasoned it with taco seasoning (my own blend, I will post that recipe when I find it... I forget what's in there!) I probably used a little less than a tablespoon. While the steak is cooking, chop up your onion and pepper. When the steak is almost done, remove it from the pan and cover with foil. Set aside. Add the pepper and onion to the skillet, season with salt and pepper. I cook it right in the steak juices (aka fat), you can add a little more olive oil if you want. Cook the veggies until they have a little bit of a carmelization, a little brown on the edges. At this point, add the steak back into the skillet and heat back through. While the veggies are cooking chop up some lettuce and tomato, if dairy's your thing shred up some cheese and maybe break out some sour cream. 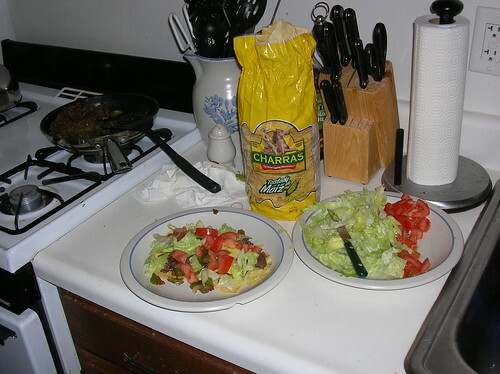 Put two tostadas on a plate, layer with steak, peppers & onions, lettuce, tomato and then top with cheese or whatever other toppings you might like. Jalapenos, beans, whatever strikes your fancy. Enjoy! Made some Spanish rice to go with it. It was not unsatisfying as is, but it just needed something else. Avocado would've been good too but I hate to cut up a whole one, won't eat it all and then it turns brown and I'll end up throwing it away. If I were cooking for more people, I definitely would've added avocado. I am going to a get together tomorrow night and I'm thinking I might bring guacamole and chips, and I also might make GF Steve's brownies for desert! Looks yummy! Do you go to a Super 88 or is there a smaller asian market in your town? Also - Whole foods always as Wheat-Free Tamari. They actually usually have it at the Shaws near me too, in the Organic section.